Fernandes has been awarded the title of Pro Vice- Chancellor. With over a decade of experience in higher education in the UAE, he has showcased great leadership skills and led the University to outstanding success, catapulting its reputation as the University of choice in the region. 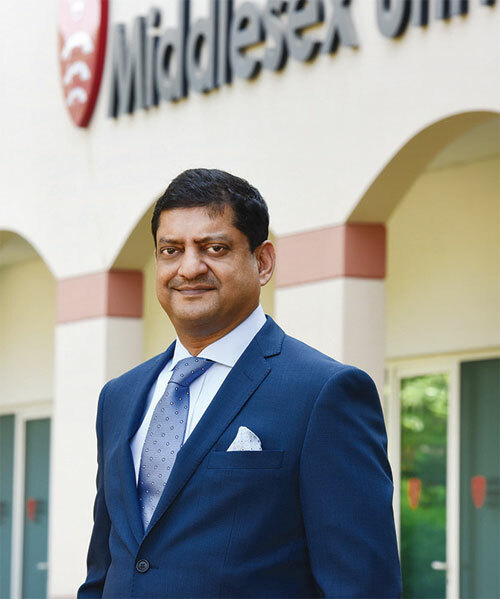 Cedwyn took over as Director of Middlesex University Dubai in March 2015, and since then, student enrolment has increased by 40 per cent and the University now offers 30 undergraduate and 37 postgraduate programmes. Under Cedwyn’s leadership, student numbers are expected to cross 3,400 in September 2018 with 38 per cent of these being international students who specificallycome to the UAE to study at the University. Hailing from the beautiful village of Siolim, Cedwyn completed his schooling at Don Bosco High School, Panjim and graduated with a Bachelor’s degree in Economics from Dempe College Panjim. Subsequently, Dr Cedwyn completed his Masters and PhD in Economics from Mumbai University. Cedwyn also has hands-on experience in the corporate world as an economist with Saudi Arabian Airlines and was in-charge of international project investments. Cedwyn has a PhD in Economics and his research interests are focused in the areas of macroeconomics, international business management and supply chain management. He has been a judge at the SCATA Supply Chain Awards, the LOG ME and Airline Business Awards and is a regular speaker at industry events. Recognising his excellent contribution, he has been celebrated through a number of awards such as Best Paper Award at First International Business Conference (IBC2008), Detroit Metropolitan, Michigan, USA; Finalist Dubai Economic Research Award(2007), Research Excellence Award – University of Wollongong (2006) and the Best Paper Award. The European Applied Business Research Conference, Edinburgh, Scotland, June 14-18. (2004) to name a few. Thanking the Vice Chancellor for this recognition, Dr Cedwyn said: “I am honoured to receive this recognitionand this is ultimately the acknowledgement of all my colleagues without whom this would not have been possible.” He further added, “The key to the success is that the University provides an outstanding student experience which is made possible by the dedication of our staff. I am grateful to all our students and alumni who are our best ambassadors and have made Middlesex University Dubai proud.